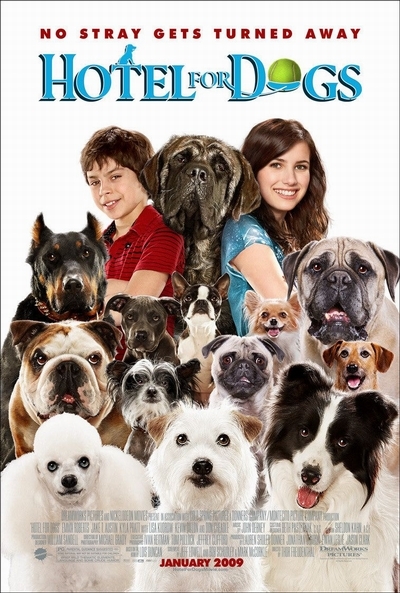 Story: "Hotel for Dogs" is a smart, funny comedy adventure that shows how far love and imagination can take you. When their new guardians forbid 16-year old Andi (Roberts) and her younger brother, Bruce (Austin) to have a pet, Andi has to use her quick wit to help find a new home for their dog, Friday. The resourceful kids stumble upon an abandoned hotel and using Bruce's talents as a mechanical genius, transform it into a magical dog-paradise for Friday - and eventually for all Friday's friends. When barking dogs make the neighbors suspicious, Andi and Bruce use every invention they have to avoid anyone discovering "who let the dogs in."